Download a flyer for the October 24th program to share! Join us for a life changing experience! Discover the essence of the Divine Feminine through ancient yogic wisdom, energetic transmission with Gurudev Amritji and creative play with the spiritual understanding of the five elements. 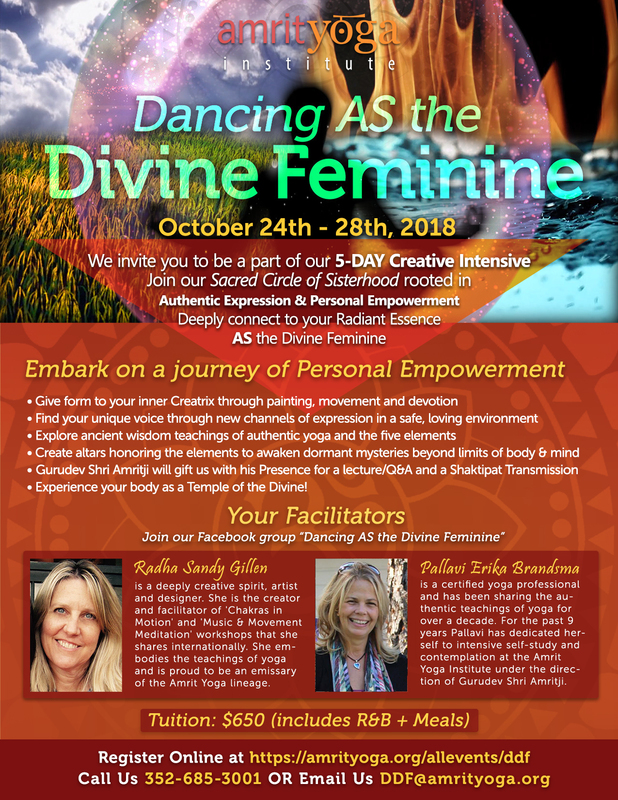 Access these teachings through the physical and subtle bodies with intuitive movement, yoga, painting and dance, expressive art and sound, to embody the guiding forces of the Divine Feminine within. Awaken Her Power and Presence within you AS the essence of the elements: groundedness, flexibility, creativity, open heartedness, clear thinking and seeing, balance and connectedness. An exploration of genuine sisterhood through sharing and devotional ritual that will allow you to see yourself and the world with fresh eyes. Nourish your soul by embarking on an inward journey of personal empowerment, authentic expression, freedom and joy with this incredible workshop. This retreat is specifically designed as a women only retreat. To maintain the group energy your attendance for the entire program is required. COME AS YOU ARE! No prior experience of yoga, meditation, painting, dancing, or chanting or the Divine Feminine is required. Registration & room assignment is from 1:00 to 3:30 pm on Day 1. The retreat opens with a gentle yoga class at 4:00pm. The intention for this class is to help you relax your body and quiet your mind so that you may begin to connect to yourself. This class is suitable for EVERYBODY! Your attendance is required through to the completion of the morning session on Sunday, which will end at 12:30. Please adjust any travel plans to accommodate this request. (Lunch will be available from 12:30 to 1:30 on Sunday). Please plan all travel arrangements to ensure you are at AYI BEFORE the 4 pm Opening Session* and depart AFTER the Closing Session, which will end at 12:30pm. *You may choose to arrive early and take time to settle in and enjoy our beautiful campus and the shores of pristine spring fed Lake Kerr. NOTE: You may wish to extend your stay with us by arriving a day early and/or staying an extra day to integrate your experience. Please ask the office for more details. WHAT TO BRING: You will receive a welcome letter from AYI upon registering for the program with details specific to AYI, driving directions, what to bring, etc. We will be creating an altar for each of the five elements. Please feel free to bring any items of significance to you that represent the 5 elements: such as crystals, stones, photos, feathers, mementos, stones, bones, etc. to place on the altar. This retreat is designed for participants to engage with the program with ‘beginners mind’. From this open receptive space we will engage with all modalities with the pure intention of gaining an experiential knowing, a felt sense of the essence of the Divine within you. 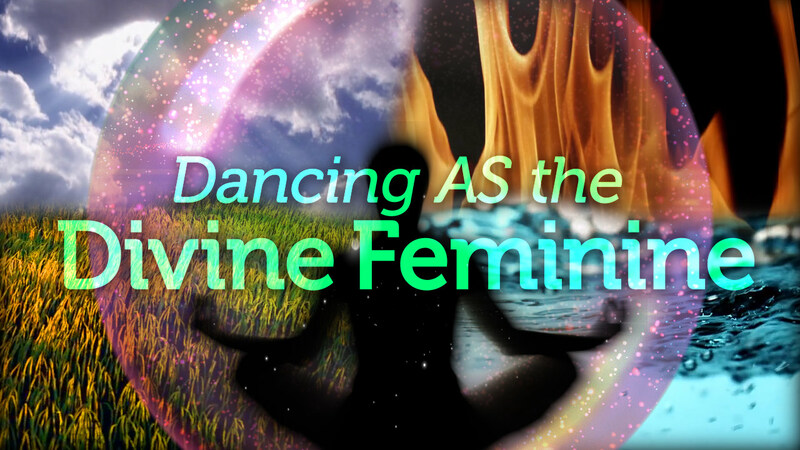 Check out our retreat related posts ~ Join our Dancing AS the Divine Feminine Facebook Group! We look forward to sharing this beautiful, transformational and life-enhancing experience with you! The below prices include room and board, if you have questions or have special housing arrangements (private rooms are available for an additional cost) call our registration office at 352-685-3001. You may also request deposit payment options by calling our office. Special Discount for Returning Students: For students who have previously attended Dancing AS the Divine Feminine the program price is $550 including R&B. Please call the main office to redeem this deal. Please note our Cancellation Policy for this program. **Must have attended DDF1 first. The Amrit Yoga Institute is located in Salt Springs, Florida, amid the tranquil beauty of the Ocala National Forest on Lake Kerr, a spring-fed lake of nearly 3,000 acres. Beneath a canopy of towering Live Oaks, the six-acre campus features lush tropical gardens, stone decks and walkway, and a peaceful sand beach. The property includes a Main House, Lodge, two small cabins and the new Ayurveda Center, to accommodate our offices, programs, and guests. The food we serve is not only vegetarian and organic, most is from a local farm. This secluded haven offers the ideal setting for a retreat of self-discovery and exploration of life’s mysteries, away from the distractions of day-to-day life. Here you can immerse yourself in a supportive, nurturing environment, and emerge enriched and transformed. Dedicated to serving and awakening the highest consciousness within all, the purpose of our campus is to provide a sacred space where you can explore the deeper meaning of life, and reach out to experience new levels of freedom in body, mind and spirit.